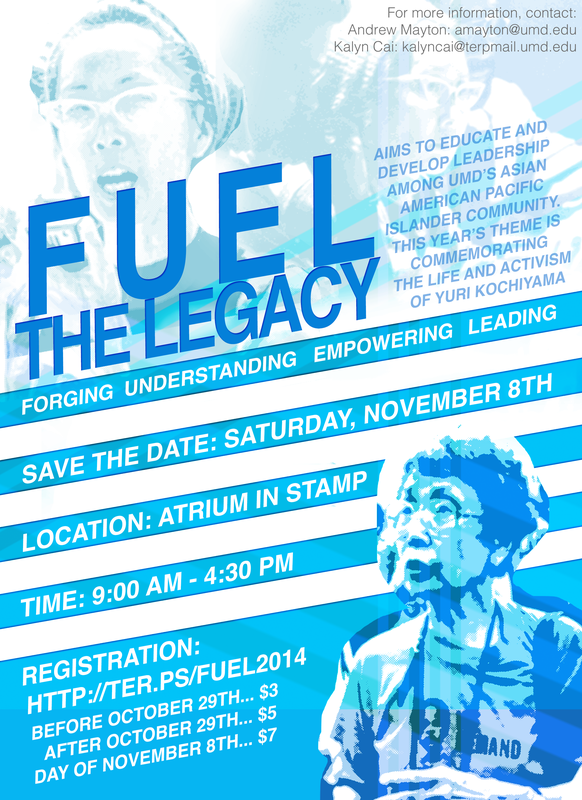 The Asian American Student Union is proud to present FUEL The Legacy! The conference will be held on Saturday, November 8th from 9am to 4pm in the Atrium in the Stamp Student Union. This year’s theme is commemorating the life and activism of Yuri Kochiyama. FUEL aims to educate and develop leadership among UMD’s Asian American Pacific Islander community. We will have open discussions about the problems of pervasive racism and patriarchy. We will also highlight the achievements of Black and Asian solidarity, of intersectional feminism, and of effective campaigning and organizing. The official FUEL the Legacy web site is now live! Visit ter.ps/fuel2014 to register! LATIN@ MONOLOGUES IS BACK THIS YEAR FOR THE SECOND TIME! Monday September 29th – Migrant Children Vigil and Call to Action! On Monday, September 29th, University of Maryland students are organizing a vigil and march on the White House for the migrant children of Central America imprisoned in detention centers here in the United States. These children are being detained in facilities that resemble dog kennels, without adequate access to food, healthcare, blankets, or books. These conditions are dehumanizing! not only metaphorically, but literally. We didn’t cross the border, the border crossed us and no person is illegal simply based on where they were born. People have been moving across the Americas for thousands of years. Movement is a part of life and freedom, and this event is part of the movement to address this injustice. We will also proudly present our growing quilt that expresses solidarity of all UMD students, faculty, and staff that stand behind the migrant children. A UMD Charter Bus is leaving STAMP Student Union at 5:00PM and returning to campus by 8:30PM (contact plumas.umd@gmail.com to reserve your seat!). The students will be assembling at St. John’s Episcopal Church (1525 H St NW DC) at 6:00PM and the vigil starts at 6:30PM. 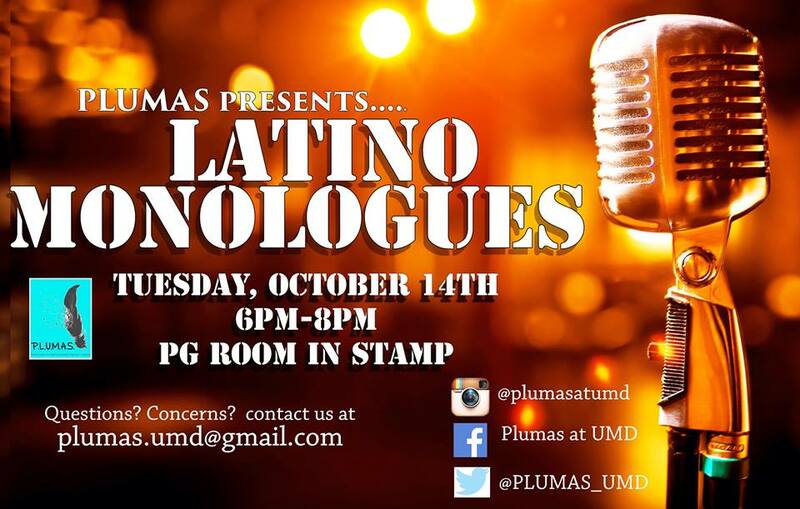 Check out the month of action planned by PLUMAS (A Latino Social Justice Student Group)! Now presenting . . . (drum roll ….wait, drum roll! not “drum circle”) THE 2014-15 UMD Disorientation Guide! This year’s Guide is the product of the work of dozens of students, workers, activists, artists, writers, poets, collaborators, comrades, and friends – from the University of Maryland and beyond – organized by RadicalRush and students in Co-op Housing University of Maryland, with support of dozens more mentors, housemates, friends, and family. An extended online version with more articles and original content is coming soon! THANKS SO MUCH to all the people that made this possible and to every contributor who sent content, ideas, love, and support to make this zine great! University of Maryland students are organizing with students and activists across the D.C. area to call for Peace in Gaza and an end to the occupation of Palestine and oppression of Palestinian people. Today, nearly 1,500 people have been killed and over 7,000 people injured in Israel’s ongoing military operation against Hamas. Most of the dead are civilians, hundreds of children have been killed, and recently, dozens of U.N. schools, hospitals, and shelters have been bombed by Israeli Defense Forces. If Not Now, When? D.C. is the local branch of a national movement of the Jewish Community harkening the famous questions posed by the first century Jewish sage, Hillel. 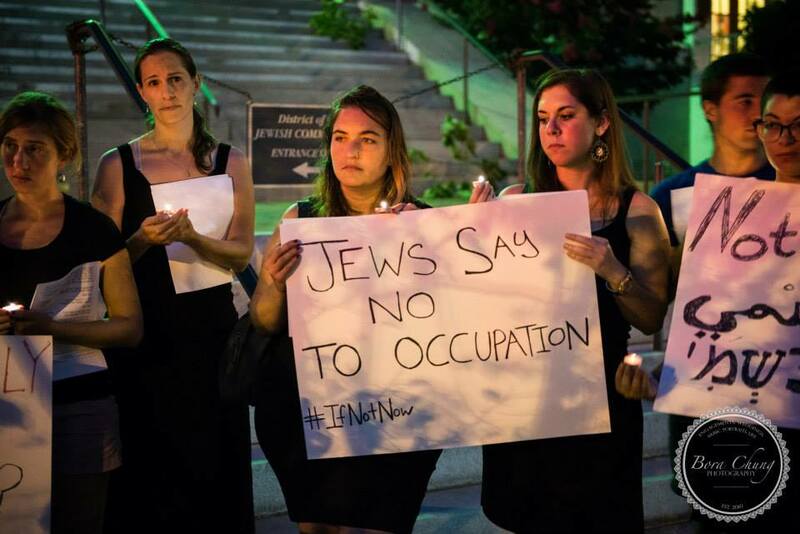 Across the country Jews are coming together to demand that the American Jewish community support an end to the war on Gaza, an end to the siege, an end to the occupation, and freedom and dignity for all in Israel and Palestine. They are protesting the Jewish institutions that claim to represent all American Jews when they defend the profound injustice Israel inflicts on Palestinians. It ignores the growing number of voices in this community who are troubled by Israeli aggression and occupation. Days of Action! 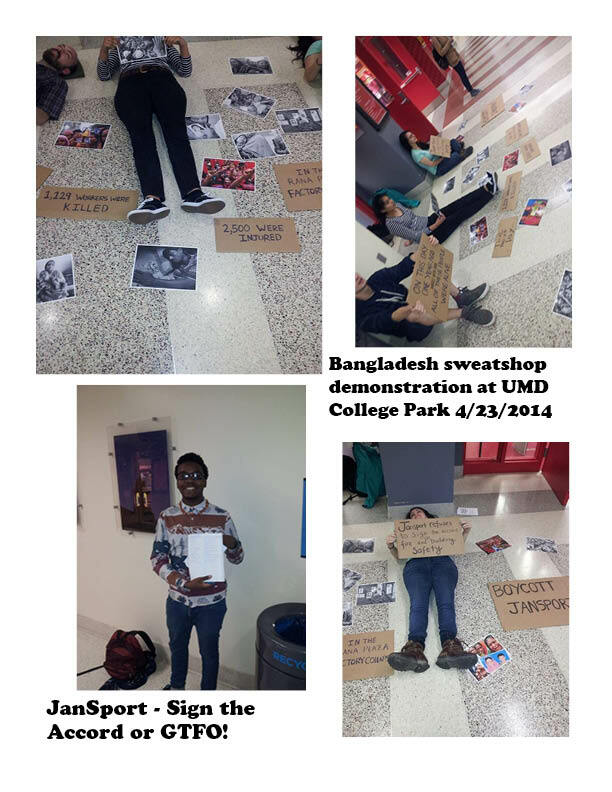 University of Maryland Students Demonstrate for Workers in Bangladesh! On Wednesday April 23, 2014, UMD students honored the 1,129 Bangledeshi workers who died in the Rana Plaza factory collapse the day before the one-year-anniversary of the disaster on April 24, 2013. United Students Against Sweatshops (USAS) and UMD students are joining together to pay their respects to the families and victims of the collapse and to demand companies like JanSport take action to prevent disasters like this in the future. 150 brands have signed the Accord including American Eagle, H&M, and Adidas, but VF Corporation, owner of JanSport, VF Imagewear, and other affiliates, have thus far evaded responsibility for the safety of their workers. 18 schools across the nation have already required their licensees to sign the Accord, including American University just yesterday!—it’s time for UMD to join them. USAS organizers and Bangladesh workers met with University of Maryland Administration officials to discuss suspending JanSport licenses in a bid to pressure them to sign the Accord, however university representatives indicated they would not take action on this issue. So students groups Justice at Maryland and Community Roots teamed up to take the message directly to the UMD students and consumers to boycott JanSport products. The event turned out really well and the reception from the UMD community was fantastic. We had so many great conversations, words of support, and got connected to more students and faculty who want to become involved. On Thursday April 24 2014 – the one-year-anniversary of the Rana Plaza factory collapse – we are delivering a letter addressed to University of Maryland President Loh to ask him to suspend the license agreement with JanSport and affiliates if they do not sign the Accord and comply with UMD business ethics standards. Also, a second demonstration is planned to coincide the the USAS National Day of Action TODAY (Thursday 4/24) at 12:30PM in STAMP Student Union. How will signing the Accord prevent this catastrophe from happening again? While no legislation can guarantee this could never happen again as long as sweatshops exist, the Accord requires collaboration with workers’ protection groups, rigorous inspections and public transparency, and it’s legally binding to the companies that sign it. Share information about the Accord and talk to other people about it! Demand that University of Maryland President Wallace Loh cut ties with VF Corporation, owner of JanSport and VF Imagewear, and its affiliates. Demand that President Loh require current and future licensees at the University of Maryland to sign onto the Bangladesh Safety Accord. 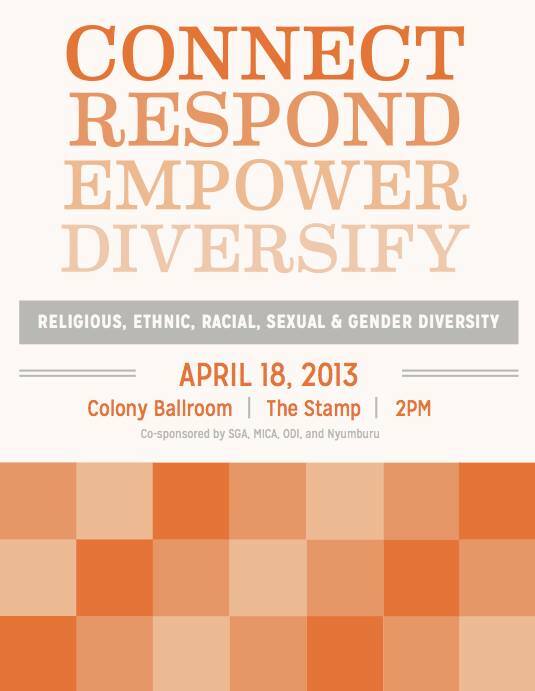 University of Maryland Student Government (UMDSGA) Diversity Committee, UMD Office of Diversity and Inclusion (UMD ODI),Multicultural Involvement and Community Advocacy (MICA), and the Nyumburu Cultural Center are co-hosting a DIVERSITY SUMMIT starting 2PM FRIDAY APRIL 18th in the STAMP Student Union Colony Ballroom. The goal of the Diversity Summit is to promote solidarity, cooperation, and support between students of diverse backgrounds by providing a platform for students to connect, inspire, educate, organize, and demonstrate their abilities to enhance the campus community and motivate others to take reciprocal action. This will be a rewarding opportunity for students from all aspects of campus life to come together and build towards a basis of mutual understanding and inclusion. This is a FREE event including LUNCH courtesy of the Office of Multicultural Involvement and Community Advocacy (MICA) and many special performances and presentations! Looking to bring social into the world of social change, Community Roots – a University of Maryland College Park student group that hosts student led discussion on contemporary civil rights and social justice issues – is hosting it’s annual celebration of hip hop, resistance, and social justice – Move The Movement 2014!!! University of Maryland Activists Reunite!